Subjects, styles, advertising, other relevant information: Herbert's father, Nathan, a Post Office Messenger, (b:1837 Fulbourne Cambridgeshire) died when Herbert was less than a year old. 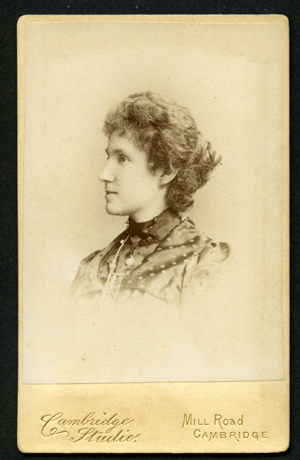 Herbert was brought up by his mother Harriett (b:1834 Dorking Surrey), who worked as a college servant. In 1901 Herbert was still single, working as a photographer on his own account from the family home then at 18 Mill Road Cambridge. 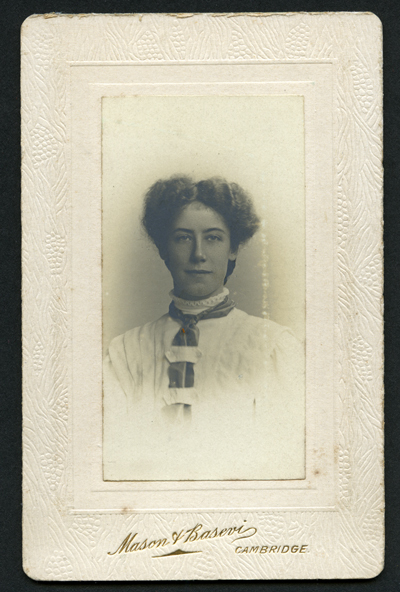 In 1902 he married Ellen, (b: 1874 Newmarket) and he was still living at 18 Mill Road, but he was described as the head of the household, although his mother Harriett was living there with them. The 1911 census shows him as a photographer working from home on his own account. When he died in 1931, Herbert was living at 5 Montague Road, Chesterton, Cambridge. 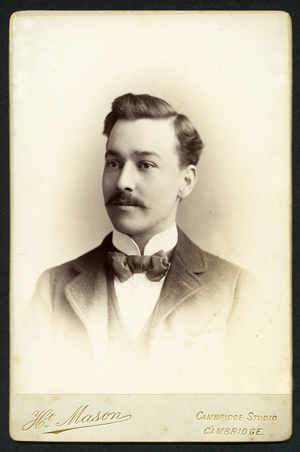 The first image below is a cabinet photograph of a vignette portrait of an unknown gentleman in bow tie and suit, c. 1890 (author's collection). The mount is cream. At the bottom of the mount is printed in gold lettering "Ht Mason, Cambridge Studio, Cambridge". The reverse of the mount is blank. Below this are two studio portraits (author's collection) of unknown young women. 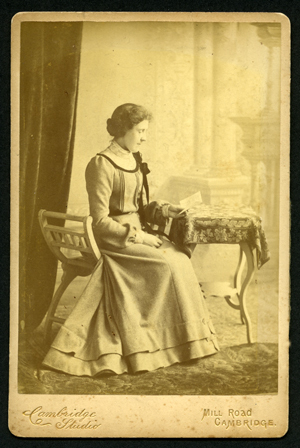 The seated subject is a cabinet photograph; the vignette is a carte de visite, both mounted on cream card with rounded corners and in impressed gilt lettering on the face have written "Cambridge Studio Mill Road Cambridge" with no printing on the reverse. 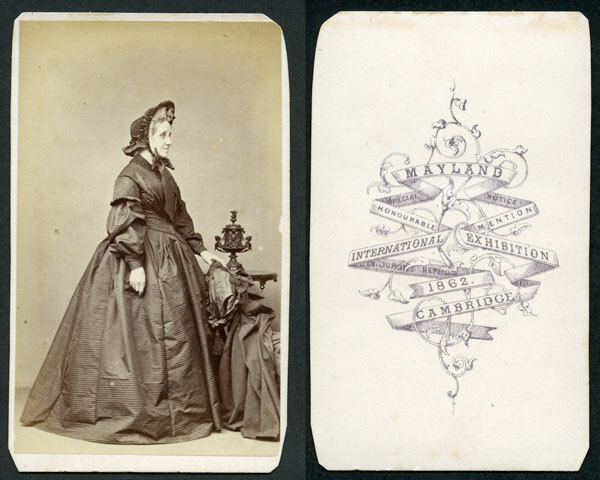 The cdv portrait is unusually almost a full side profile or silhouette which has been well lit. Both images could be from around 1900 - 10. Kelly’s Directory of Cambridgeshire 1916 shows photographer Ethelbert W Baker-Smith operating at 18 Mill Road. 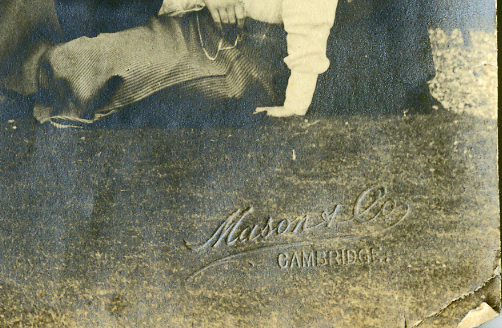 Cambridgeshire Collection’s Carte de Visite Collection c.65.5 has one carte and two cabinet photographs from Herbert Mason, carrying the address "Cambridge Studio". Subjects, styles, advertising, other relevant information: Mason and Basebe followed Ralph LORD. 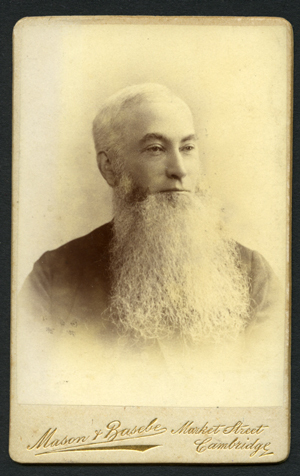 See below a carte de visite from the author's collection, head and shoulders portrait of impressively bearded man, on cream card with bevel edge with gold writing "Mason and Basebe Market Street, Cambridge". Reverse is blank with name of sitter in manuscript "Mr Doran"
It seems likely that the "Mason" part of this business was Herbert Charles Mason who is listed above, although Mason and Basebe and Herbert Mason both appear as separate entities in the same directories 1900-10. A clue can be found in a court case recorded in the Cambridge Independent Press on 28th April and 5th May 1905. This was a case of the theft of a camera from Herbert Mason by one George Werner de Sondeberg. The defendant persuaded Mason to employ him canvassing for business and then stole and pawned a camera which Mason had allowed him to use in that work, before absconding with the proceeds. The report of the case describes the victim as "Herbert Mason, Photographer, Market Street and Mill Road Cambridge". The Basebe part of the partnership was Edgar Allan Basebe b:1860 Camden Town London. Edgar was one of the children of Sussex portrait painter Charles J. Basebe (1818-1880). Charles and his wife Caroline had nine children, a number of whom became artists or photographers. Edgar Allan Basebe appears in Cambridge in the census returns for 1891, 1901 and 1911. In 1891 he was living at 48 Mill Road, Cambridge with his wife Mary A Basebe (b:1866 Bath Somerset), their son Edgar Elphege Basebe (b:1888 Cambridge), and Edgar's mother Caroline Basebe, a widow, (b:1821 Paddington). Edgar was described as a photographer. The family name was spelled as "Basebé". In 1901 Edgar and family were at 116 Mill Road Cambridge - his mother was no longer with him but they had a second child, Anabel (or Amabel) Mary Basebe (b:1896 Cambridge). 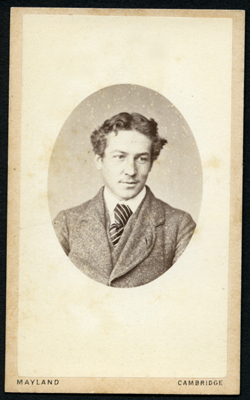 Edgar was described as a photographic artist, a worker rather than an employer. In 1911 Edgar and his wife Mary were resident at 13 Eltisley Avenue, Newnham, Cambridge (the census return has been wrongly indexed in the surname "Basen" - a transcription error). Also in 1911, Edgar's son, Edgar Elphege, and daughter, Anabel Mary, were running their own photographic studio, The Abbey Studio, at 32 Gloucester Street, Malmesbury, Glos. The whole family appear to have changed their surname by 1911 to "Basevi". Edgar (Snr) died in Chippenham in 1922. References: A detailed history of the family of Charles J Basebe can be found on David Simkin's excellent Sussex Photo History site http://www.photohistory-sussex.co.uk/EGrinsteadPhotgsAD.htm . 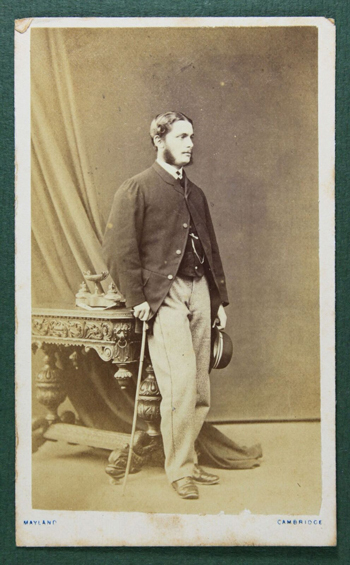 Cambridgeshire Collection’s Carte de Visite Collection c.65.5 has one example from the firm. 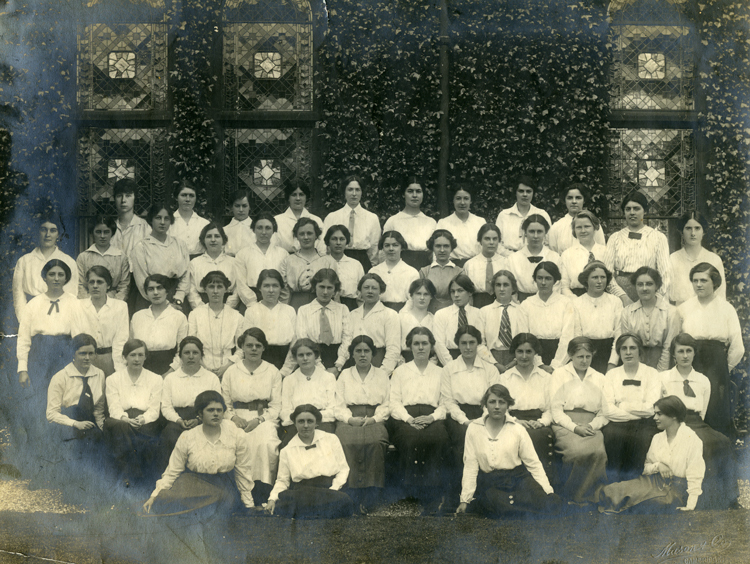 Subjects, styles, advertising, other relevant information: Below is a photograph11 x 9 inches of a first year group of ladies from Girton College Cambridge, taken outside an ivy clad Stanley Library (author's collection). In the lower rh corner is an impressed mark "Mason & Co Cambridge" probably done with a hand embossing press. This has been dated by the Girton College Archive as being the 1914 year group - they have a version with every individual named (their Ref GCPH 10/9/1). 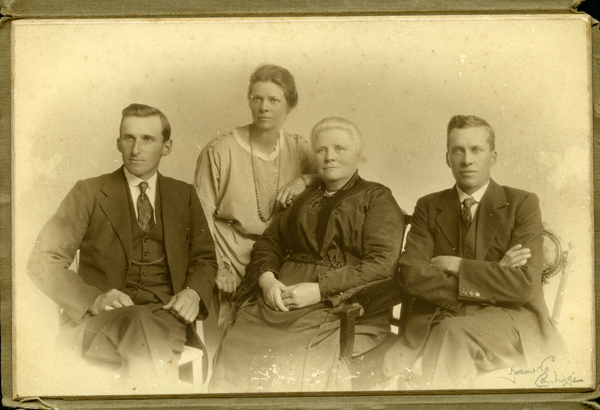 Below this is a 6 x 4 inch photograph of an unknown family group, possibly mother, daughter and two sons, c 1920, (author's collection). The image is mounted on card with a chamfered edge and no border. Below this is the detail of the studio signature found in the lower RH corner. Below this is the brown card protective wrapper to which the photo is attached. This has the legend "Mason & Co Cambridge" in brown ink and has an impressed Cambridge Borough crest. Spaldings Directory of Cambridge 1915-33 NB - both Mason HC and Mason & Co are separately listed in Spaldings 1915 and 1919/20 Directories of Cambridge - so may, or may not have been two +parts of the same business. Subjects, styles, advertising, other relevant information: Norman Mason-Smith was the Chief Photographer at Cambridge City Council and was involved in extensive photography in the City. In July 1978 he had an exhibition of his work at Great St Mary's Church Cambridge as a part of the 500th anniversary of the Church. References: Cambridge Evening News 12 July 1978. Subjects, styles, advertising, other relevant information: In the 1939 Register George was listed as a photographer at the above address. Also at this address were Nellie M Holmes b: 13/5/1894 college bedmaker, and John Holmes b:1927. In 1911 George was a lodger in Gloucester at 5 Worcester Parade, where he was listed as a self employed photographer working in Gloucester. 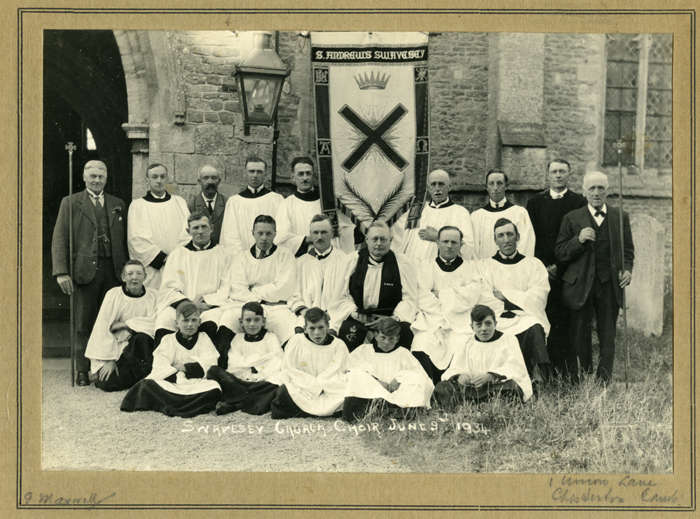 Below is an example of George's work, a group photograph of the Swavesey Church Choir June 3rd 1934. The image is 6in x 4.5in mounted on a light tan mount. Written in pencil beneath image is "G Maxwell, 1 Union Lane, Chesterton, Cambs." 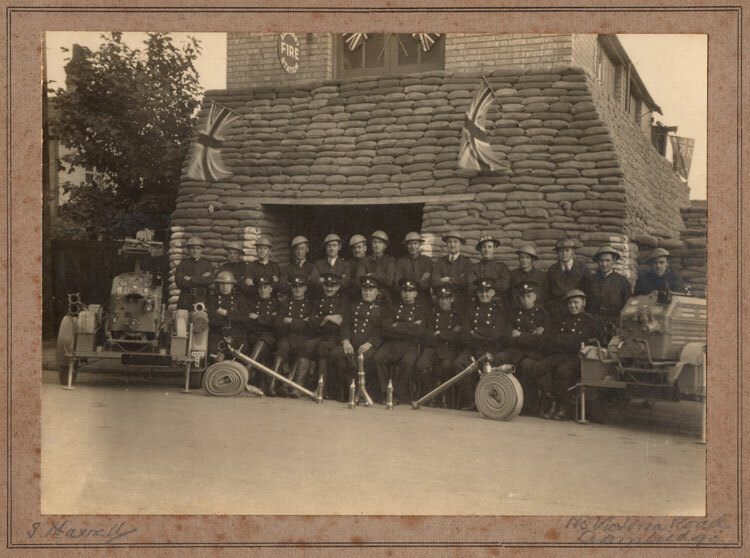 Next are two group photographs by Maxwell of Cambridge Auxiliary Fire Brigade personnel, taken during WW2. These utilise the same brown card mount with double black line, inside which is written in pencil "G.Maxwell 185 Victoria Road Cambridge. These photographs belong to Diane Clark, and we are grateful to her for permission to reproduce them here. 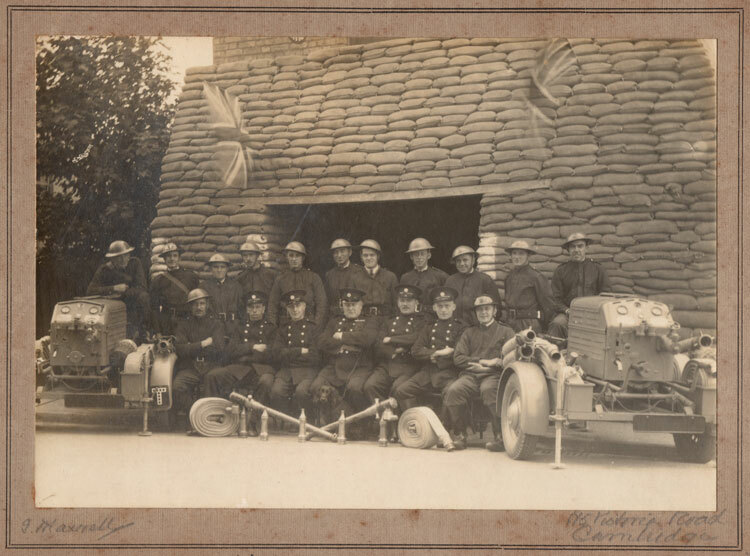 The mount of the first of these two photographs has the names of some of the group added in manuscript by an owner of the photograph - the names are: J.Hislop, J Clements, George Clark, J.M.Roberts, L.H.Rolfe, W.H.Lilley, W.I. Cullin, J.Tibbs, J.G.Mason. In the Cambridge Daily News 27 August 1936 we get a glimpse of Maxwell's overall philosophy and the level of success of his business. Amidst a plethora of letters to the Editor on what the writer would do with an unexpected gift of £50, he wrote: "Sir, I would lay in a stock of materials to keep me going through the slack period, and work hard and close to get all orders in during the fine weather: pay a year's rent in advance, give £5 towards the Poor and Needy Fund, and bring a little life and enjoyment to others who endeavour to make ends meet on small earnings. I never buy anything I cannot afford or spend my money on pleasure, it is all used to pay cash and keep clear of debt. A photographer's life is all ups and downs, but worth the struggle. yours etc. G Maxwell". Subjects, styles, advertising, other relevant information: The 1891 census shows Henry Mayhew at the above address, employed as a photographer. Living with him were his wife Frances E Mayhew b: 1854 Carlisle, and children Lavinia b: 1880 Inverness, Caroline b: 1883 Inverness, Sidney b:1885 Ipswich, Ruth b:1888 Peterborough and Ida Jane b: 1890 Peterborough. In the previous two censi, Henry was a photographer living in Inverness. By 1901 Henry and his family were back in Scotland at 13 Lennox Street, Renton. His occupation in 1901 was described as "labourer printfield". It is not known at this time who in Peterborough employed Henry. Subjects, styles, advertising, other relevant information: According to Heathcote, William Mayland started in photography as an itinerant photographer in Truro and Liskeard in 1854. 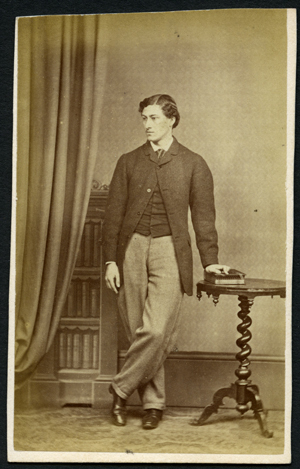 Listed in Cambridge in 1858 as "Photographic Artist" he was one of the earliest commercial photographers in Cambridge. In the 1861 Census William and his young actress wife Mary (née Hodson b:Dublin 1833), were living at 2 Clarendon Street Cambridge. William was commissioned to take photographs of Royal groups at Sandringham in April 1866. 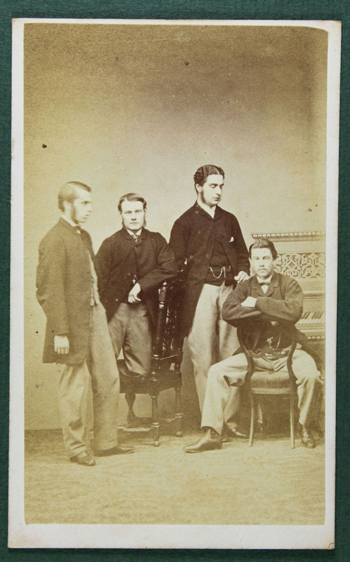 See below an early carte de visite of an unknown group of University men from the Simpson Family Archive The back-stamp on the carte has the 1858 to 1864 Market Street Address. 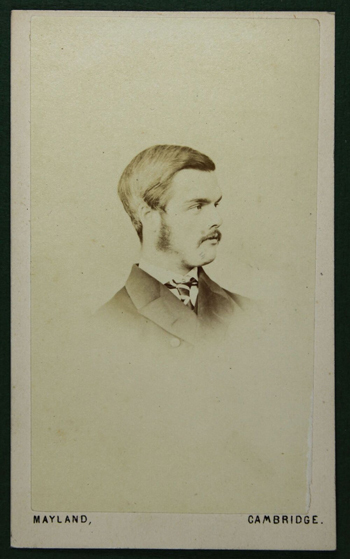 Below this is a carte de visite (author's collection) full length portrait of young man, the reverse has printed in purple in a fancy scroll design "Mayland special notice honourable mention International Exhibition in Jurors report 1862 Cambridge", from the early 1860s. Below this is a full length portrait of the same period of a lady in crinoline standing in front of a blank background; her dress, posture and the elaborate urn used as a studio prop all suggest that the unknown sitter may have been a lady in the second stage of mourning. The reverse of the carte has the same design as the previous example, but printed in black. The mount has been trimmed to insert in an album or frame. Note the table is similar to that in the previous image. 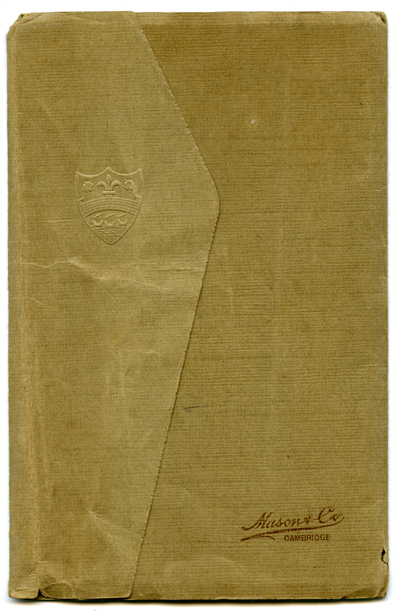 (kindly donated by John Doyle of Taunton). 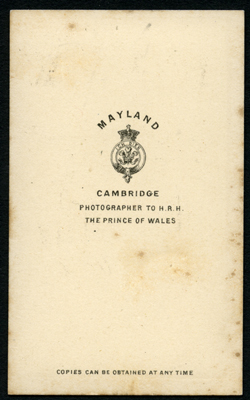 Next a vignette portrait of an unknown man, mounted on white card, square corners, on reverse is printed "Mayland Cambridge Photographer to HRH The Prince of Wales. 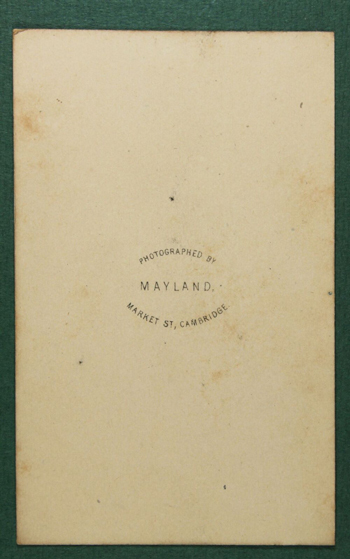 Copies can be obtained at any time" and on face "Mayland Cambridge" late 1860s, early 1870s. 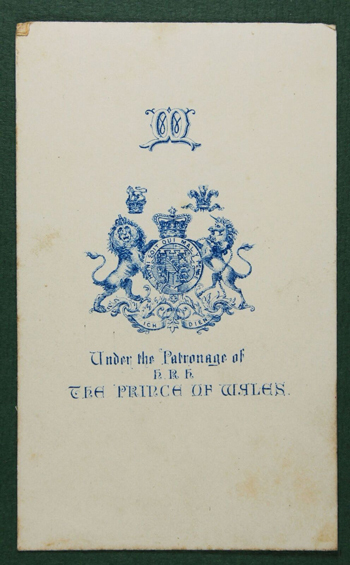 Next are two further cartes from a similar period from the Simpson Family Archive , the reverse of each shows claims of Royal patronage. According to Heathcote, in 1870 Mayland moved to London forming a partnership with a Thomas R Williams, with whom he had a business arrangement going back some years. In the 1871 census, William and Mary were living at 63 St Pauls Road Islington.The partnership, TR Williams and W Mayland of 236 Regent Street, continued until 1880, despite the death of Williams in 1871. The reverse of cartes de visite by the partnership claimed Royal patronage and the award of medals in London in 1862 and Paris in 1855. However, Mayland may in some way have continued trading in Cambridge for a little longer, perhaps using his own name but with an employee operating the business, or even selling the business and allowing his successor to continue trading in his name. Evidence for this can be found in the announcement by William Farren in December 1874 that he was taking over premises at 20 St Andrews Street "lately occupied by Mr W Mayland" , (Cambridge Chronicle and Journal - Saturday 26 December 1874). Also in July 1875 the premises at 20 St Andrews Street were offered to let and were described as "fitted for a fiirst rate photographic establishment for which they were erected by Mr Mayland". It seems unlikely that the premises would be referred to in this way had they been unoccupied by Mayland since 1870. 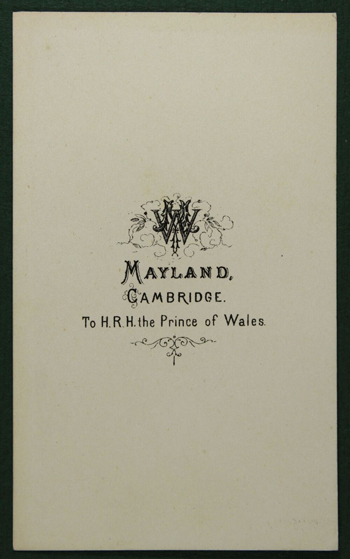 An added complication is the fact that Joseph Rylands stated on his cartes de visite that he was the successor to Mayland - which could have referred to any time after 1870 or after the premises were advertised in 1875. Cambridge Chronicle and Journal - Saturday 26 December 1874 - William Farren taking over 20 St Andrews Street. Cambridge Independent Press - Saturday 17 July 1875 - former Mayland's Studio 20 St Andrews Street available to rent. 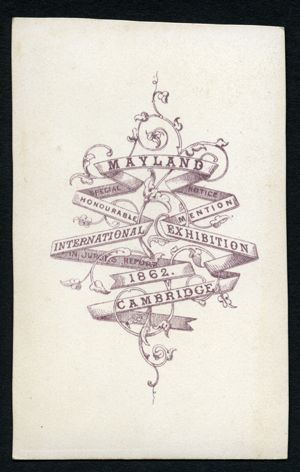 Cambridgeshire Collection’s Carte de Visite Collection c.65.5 has two of Mayland’s cartes. A Faithful Likeness - The First Photographic Portrait Studios in the British Isles 1841-1855, Bernard and Pauline Heathcote, 2002. Subjects, styles, advertising, other relevant information: George Maynard was listed as a photographer in Cambridge in local directories from 1874 - 1907. In 1871 George Maynard, described as a photographer and french polisher, was living with his brother in law and family. His brother in law was photographer William Squires, practicing at 29 Corn Exchange Street, Cambridge, and it was probably here that George learned the trade. In the 1911 census George had apparently ceased working as a photographer and was listed as a stationer etc, operating from his home in Victoria Road Cambridge.